As promised, here's a rundown of the new handguns we got a chance to see and shoot at PASA Park. 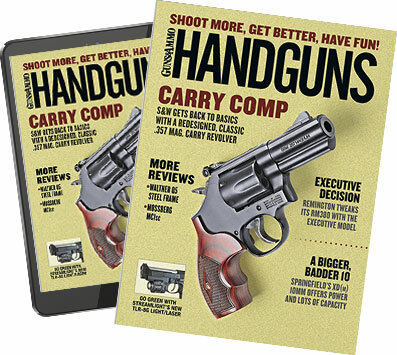 I'll start with a gun that will be gracing our December/January cover of Handguns: the Beretta Nano. It's the latest entrant into the subcompact 9mm race—typified by such guns as the Ruger LC9, Kimber Solo et al. The striker-fired Nano is remarkable for its lack of external levers: there's no safety, no slide stop to catch on anything. Just rack and go. I found it very controllable for a light pistol, and despite the minimal sights, I was able to run the plates well with it if I took my time. The gun will be on shelves in mid, late October and is expected to retail for around $475. More to my taste is the new Specialist, a full-size Government 1911 with an accessory rail. Similarly striking grips. No word on price, but probably in the mid to high $1,000s. With the extra weight and a superb trigger, it was easy to hit with. Both the ECO and Specialist are targeted for a first-of-year distribution. Minnesota facility: the IWIs have the original two-piece barrel, whereas MRI-built guns have the gas port drilled all the way through. In a concession to modern tastes, the IWI gun has a Picatinny rail on top, which original IWI guns didn't have. So that was huge fun to shoot, but so was the other .44 Mag. that MRI brought: the BFR revolver. I leave it to your imagination what BFR stands for, but it's a big, massively built 5-shot revolver available in 12 powerful chamberings. In .44 Mag. the BFR was almost a pussycat, and aside from that the most fascinating aspect was the cylinder. Spin that sucker and it would keep going like the Energizer Bunny. Some fine machining and design going on there. issue of Handguns. Basically it's a PM9 that sells for about $200 less. Cost savings comes from traditional rifling on the CM9 as opposed to the polygonal rifling on the PM9. And the CM9 comes with just one magazine instead of two. It'll sell for about $560. The DAO trigger takes a little getting used to, but once you do, wow. Super easy to hit with for a small 9mm.